Chris Harris misses the meeting at Workington tonight. Peterborough Panthers owner Ged Rathbone has spoken of the club’s struggles to track a team at Workington tonight (September 2). The Panthers make the long trip to Cumbria (7pm) for one of four SGB Championship fixtures taking place on the day. Peterborough are having to rely on guests with three of their regular riders missing as number one Jack Holder races in the World Under 21 Team Cup Final, Chris Harris competes in the latest round of the World Long Track Championship, and Bradley Wilson-Dean is still out injured. Club bosses had secured the services of Scott Nicholls to step in for fellow British star Harris, but a change of Harris’ average, which came into effect yesterday, means he is no longer eligible. Peterborough did ask for special dispensation to still allow him to race – with Workington’s blessing – but were not given the green light by the British Speedway Promoters’ Association (BSPA). They will now operate the rider replacement facility at number one while calling on guests Steve Boxall and Adam Roynon, who both race for National League outfit Plymouth, to replace Harris and Wilson-Dean respectively. “Our promoter and team manager have spent days on the phone trying to organise guests,” said Rathbone. “Unfortunately there are very few riders available due to the number of meetings taking place tonight – and any that are free simply don’t want to take a guest booking at such a busy stage of the season. “We’ve had the same answer from pretty much everyone we have contacted – and even the guest we did book was then not able to ride due to Chris’ average changing! Nicholls will still guest for Peterborough on Sunday when they entertain Glasgow at the East of England Arena. He steps in for Holder for that fixture with Harris returning to the line-up. WORKINGTON: Craig Cook, Mason Campton, Ty Proctor, Matt Williamson, Thomas Jorgensen, James Sarjeant, Tom Woolley (guest). 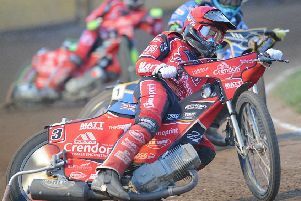 PETERBOROUGH: Rider replacement for Jack Holder, Adam Roynon (guest), Paul Starke, Ulrich Ostergaard, Steve Boxall (guest), Simon Lambert, Tom Bacon.